The Pentagon has argued that past claims have often been exaggerated. David Hicks is due to appear before a US military commission next week on a charge of providing military support for terrorism. Ahead of his appearance, protestors in Sydney have unveiled a life-size replica of his cell. This will then go on a national tour of Australia. 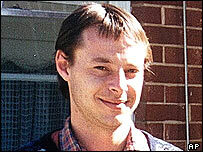 The allegation that David Hicks was forcibly sedated has come from his US military defence lawyer, Major Michael Mori. He claims the Australian was given medicine last month just before being informed about the new charge levelled against him. According to Major Mori, the 31-year-old was sedated for 24 hours - an allegation that Australian consular officials have now raised with the US authorities. The Pentagon said it would examine the claim but argued that Mr Hicks has been humanely treated and that previous allegations have proved unfounded. In Sydney, campaigners have put on display a life-size replica of the cell where Mr Hicks is being held. The white-walled structure measures 1.8m wide and 2.4m long and is modelled on a Pentagon photograph showing where the detainee is confined for 22 hours each day. Put on display in the centre of the city, one student was close to tears after spending just two minutes alone inside.